This is the best system for anyone with a Toy Hauler. You can have one camera in the back looking at the road behind you and one camera INSIDE your toy hauler. This ensures that whatever you are hauling is strapped down safe and sound. The cameras have excellent night vision so they can display a great image inside the Toy Hauler even if it is dark. The Toy Hauler Box camera Has a 120° Degree viewable angle, its waterproof and has auto night vision. Has optimal reception for up to 70ft this allows it to work perfectly without interruption in any vehicle. The camera is one of the most durable we have, with incredible adjustability and night vision clarity. The RV Box camera has a metal sun shield visor to protect you from glare and pebbles. This is by far our toughest built camera. It has been regularly used in cars, vans,buses and even industrial sized caterpillar trucks, operated in the harsh oil sand of Canada. This camera can take a direct hit from a rock and it will still work like new. It has also been very popular with RVs because its housing allows you to install the cameras on multiple sides of your RV. In this system, you get 2 cameras and you can mount these cameras anywhere you want. They work next to each other or far from each other it makes no difference. Basically it's up to you where you want them and what you want to see, the possibilities are endless. 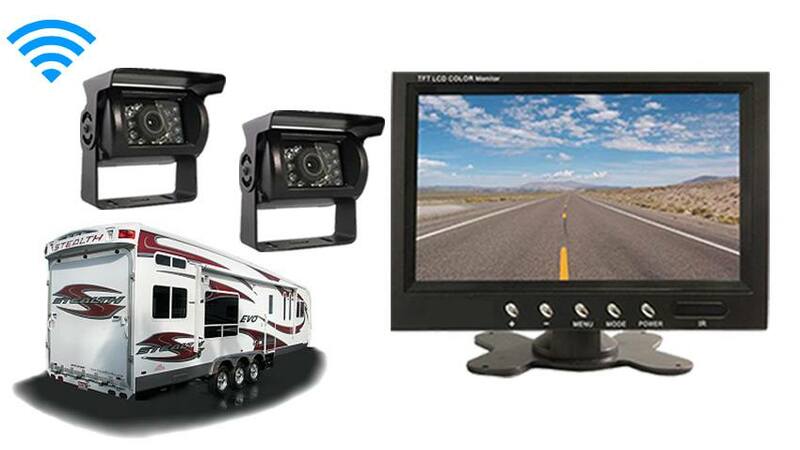 "I purchased, received, and installed one of your two camera wireless RV systems. The reviews stated the setup was simple, and your instructions clear. I opened the box and holy mackerel look at all the wires. After overcoming my initial anxiety, I followed your instructions one step at a time, and once completed felt silly for my initial reaction. Setup really was simple, and unlike the cheap system I tried from eBay yours works. I'm very happy with the setup and operation of my new system, and now I'll just wait and see how it lasts through the test of time. Thank you! Warmest regards, Jim"